Vittas: Wade is everything you want in a top of the order hitter. He gets on base in a variety of ways, makes consistent solid contact and is a threat on the bases. He walked 10 more times than he struck out this year (20 K, 30 BB) and drove in a remarkable 32 runs in 42 games as a leadoff hitter. After originally being tagged as second half of the draft guy, Wade’s stock is rising because of his terrific run in the NCAA Tournament. He made three run-saving plays in the Regionals, showing off his remarkable athleticism and cannon for an arm. Lewis: LaMonte Wade Jr. is an extremely gifted CF with tools galore. He is a fast-twitched athlete whose tools play up from his move from 1B to CF. He gets incredible reads on flyballs and makes difficult plays look easy. He has plus plus range in CF and has a very strong arm to boot. 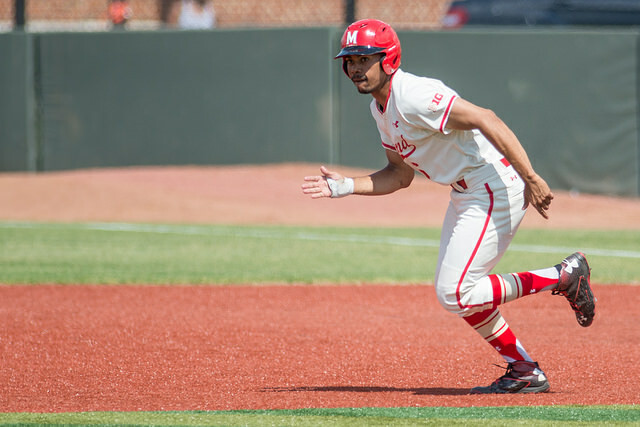 Wade has hit the national spotlight with his assortment of highlight defensive plays over the last week or so in the Terps postseason run, but don’t underestimate Wade’s ability to square up a baseball. Despite an injury sidelining him for 4 weeks, he has been so consistent all year in squaring up balls and hitting the ball hard on the ground. Wade is a prospect with a significant amount of helium and could sneak himself into a top-15 round pick.